Below are the projects that we have taken on to better the community around us. On November 8, 2014, Hart Plaza flagpoles were not bare or in disrepair for the first time in 14 years. Revolution Flag Foundation headed the project to get brand new American flags on the 19 flagpoles at the riverfront venue. After receiving donations from the UAW Ford, Revolution Flag Group gutted the flagpoles replacing them all with brand new parts such at winches, cables, trucks, gold balls, removal of old lighting and electrical wiring that pose danger to the community and/or the workers of the company and etc. Revolution Flag Group then repaired four (4) extra flagpoles that are located behind the UAW Ford building at the request of the UAW Ford. On September 18, 2014, Revolution Flag Group donated 56 brand new American flags to the police and fire department. 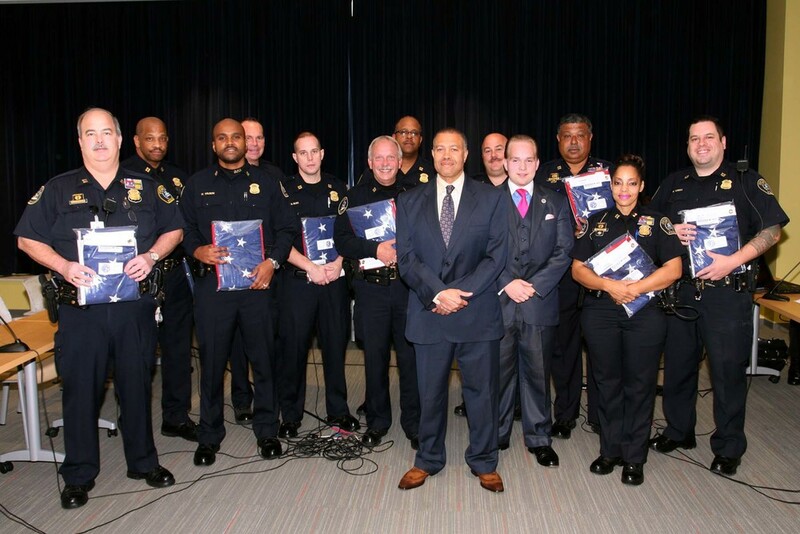 The event took place at the Detroit Public Safety Headquarters. In August of 2014, Revolution Flag Group installed four (4) 20 ft flagpoles in the front of Cody High School and repaired the pre-existing flagpole that is located in the center of the photo above.